Like any other type of betting, casino gambling has its own language. The proficiency and experience of a player in casino betting can be easily determined by how well he/she knows and understands the various casino terms. Although there are hundreds of phrases and expressions used in casinos, some being specific to particular places, there are some basic casino terms that every player should know. These terms and phrases can only be learned by playing in real (or online) casinos. Here we are trying to include all the terms, expressions or vocabulary which are using in Casino. Read continuously to be aware of them. 3 Card – 3 card or 3 card poker is a casino table card game. It is a variant of poker, which is played with only a single deck of cards and each 3 card poker hand has exactly 3 cards. Action – The total amount of money a player wages during an entire playing session. All-in – When a player calls or bets all his/her chips in a round or on a particular hand, it is called “Going all-in”. Bad beat – A term used in online poker games (rooms) to refer to the situation when the player hand is beaten by a better hand. Bankroll – The total money a player is willing to spend on his bets on a specific day or in a specific game. Betman – A term used to refer to the player who is making a bet in one of the casino games or on a sportsbook. Also usually called a bettor or gambler. Blackjack surrender – An option given to blackjack players where they can fold their hand in a game and receive half of their bets back. Card Counting – A technique used in blackjack that involves keeping track of the dealt cards with the aim to predict the next card in the deck. Croupier – The term used to refer to the dealer in the game of roulette and baccarat. Grand Dragon or Green Dragon – A famous Malaysia based casino that offers online casino gambling services in the region. High Roller – The players who make big bets are usually called high rollers. Jackpot – This is the biggest award you can win at a particular online casino game. Money lines – It represents the betting lines describing the amount a player needs to wager in a specific bet. Martingale – A betting system that involves doubling-up your bet after each loss with the aim to recover all your investment with a single win. Odds – The ratio of the probability of a player winning a particular bet or the figure by which his original stake will be multiplied and paid if they win. On a rush – When your luck is doing good and getting you free bets on a roll. Rabbit hunting – The act of seeing the cards that would have come up if the last hand had continued. Stickman – A casino employee who manages and oversees the game. To have a bullet – when you have an ‘ace’ in the game. Tom – A term used to refer to a bad tipper. 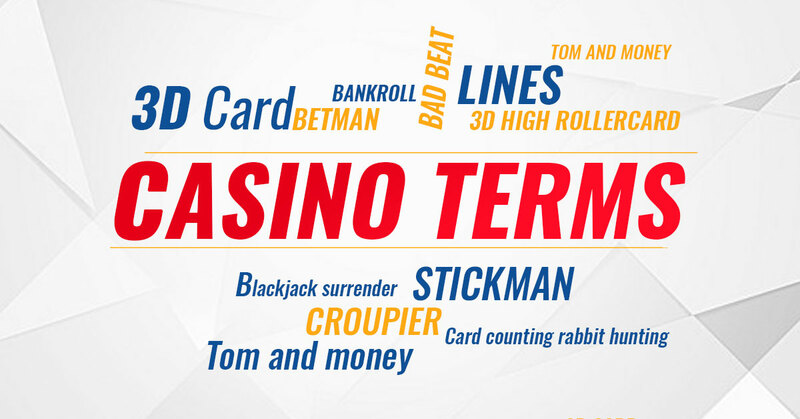 These are only a few of the important terms used by online casino players. For the complete list, you can search online for casino gambling glossary.